This would make a wonderful gift idea for a kid on your holiday shopping list! You can get the K’NEX Thrill Rides Web Weaver Roller Coaster Building Set for only $41.99 right now on Amazon! That is a BIG savings of 48% because this set is normally $79.99! This set contains over 430 pieces. It features glow-in-the-dark pieces, allowing builders to play at night and experience a different kind of fun. Make sure that you grab this deal on Amazon soon because the prices can change at anytime! 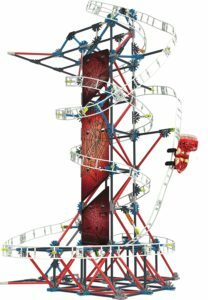 CLICK HERE TO ORDER the K’NEX Thrill Rides Web Weaver Roller Coaster Building Set for only $41.99 today!